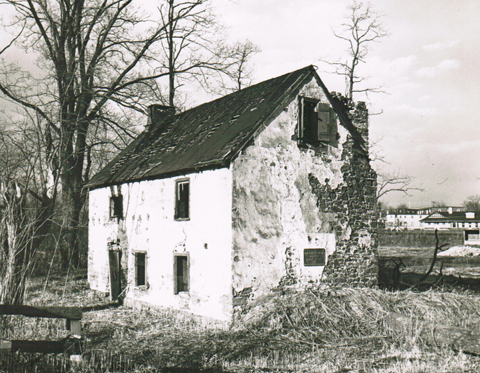 The Jones family is descended from early Swedes who had settled along the Delaware River. The colony of New Sweden was founded by the New Sweden Company in 1638. Beginning at Fort Christina (present-day Wilmington, Delaware), the colony quickly spread up the Delaware River towards present-day Philadelphia. Among the early settlers of New Sweden was Mounce Jones’ father, Jonas Nilsson. He was born in 1621 in Sweden, emigrated with Governor Johan Bjornsson Printz in 1643 and settled at Fort Christina. Although he was a tailor by trade, he was a member of the Royal Swedish Army and served from 1643 to 1645 with the Swedish garrison at Fort Elfsborg. A 1644 Governor Printz report listing the inhabitants of the colony has a “Joenn the Tailor” labeled as a member of the garrison of Fort Elfsborg. Whether or not this tailor is Jonas Nilsson or not has not been confirmed, however. Fort Elfsborg was designed to protect the colony of New Sweden; it was located near present-day Elsinboro at the mouth of Salem Creek in Salem County, New Jersey. The fort had iron and brass 12pd cannons mounted on earth and wooden palisades and was garrisoned for at least one year. Eventually, Jonas Nilsson would acquire two hundred acres at Kingessing in modern-day West Philadelphia and made his home near present-day 77th Street and Laycock Avenue. Jonas married a Gertrude and they had four daughters and seven sons. The wealth of Jonas Nilsson was accumulated by trading for furs with the local Native American population. Eventually, he became the business advisor of Armegot, the daughter of Governor Printz. She had become responsible for her father’s holdings when he returned to Sweden. Later, he would acquire an additional two hundred and seventy acres at nearby Aronameck from Peter Yocum and he divided this land up amongst his three eldest sons—including Mounce Jones. In September of 1671, Jonas was a member of the Swedish militia and is known to have buried two servants that had been killed by Indians on Burlington Island. Jonas died at the age of seventy-three in 1693 and was buried at Old Swedes Church in Philadelphia. The Jones family was one of four large families which settled together in the Oley Valley. The Swedish enclave which arose in southeastern Berks County was mostly related to Jones through either blood or marriage. Mounce Jones died in 1727 and is buried in the St. Gabriel’s church yard in Douglassville, Pennsylvania. In 1735, Brigitte Huling (granddaughter of Mounce Jones) married William Bird of Hopewell Furnace fame. Andrew Jones (son of Mounce) married Dorothy Gouther in 1736. John Kirlin, a later owner of the property, was living in the Morlatton region by 1754. John and his wife, Elizabeth, have a son named Samuel in 1762. Also, Kirlin was a vestryman at St. Gabriel’s Church from 1763 to 1767. 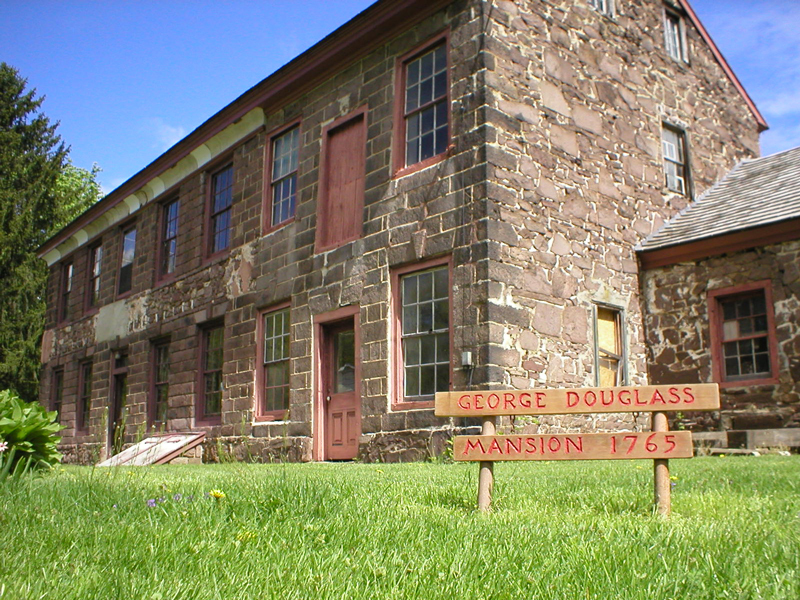 The late eighteenth century and early nineteenth century history of the property is directly related to the Douglass family. The history of the Mounce Jones property and its surrounding area are directly linked to the Schuylkill River. Apparently, at the earliest period canoes were the primary form of transportation, even to Philadelphia. Nevertheless, in 1709, Mounce Jones signed a petition to have a road made to Manatawny. Jones was appointed to lay out this road, but it was never approved and therefore never created. Probably during the ownership of Andrew Jones (son of Mounce) and definitely prior to 1820, the house was used as a tavern and known as the Lamb’s Inn. The tavern was probably operated by Mounce Jones’ grandson, who also may have built the adjacent Bridge Keepers house. Much like the White Horse Inn, choosing to operate a tavern from this location was wise due to the proximity of the ford and the road junction near the house. The original church was a hewn log structure and was later replaced by the stone chapel. The log building stood near the eastern edge of the St. Gabriel’s property, was a twenty-four foot by thirty foot, one story structure that had a doorway which faced east. The old stone chapel was completed in 1801. After the stone building was put into use, the log structure was used as a school house until it burned in 1832. The tuition to attend the school was four cents a day or $2.50 for three months. The current chapel at this location was built in 1884. The old stone chapel on the St. Gabriel’s Church property was placed on the National Register of Historic Places on March 8, 1978. After John Kirlin acquired the Mounce Jones property, he built a smith shop on the property. Kirlin’s blacksmith shop was probably directly across the street from the George Douglass mansion. The stone foundation under the modern house at this location consists of sandstone laid in an eighteenth century fashion. It is possible that the current house sits upon the foundation of Kirlin’s blacksmith shop. During the late nineteenth and early twentieth centuries, the house went through a variety of uses. 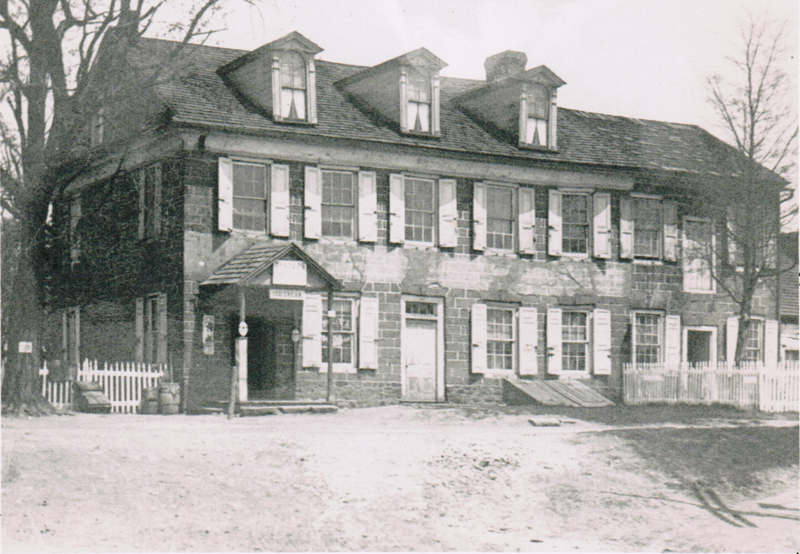 For a time, the house was used as a hotel by lumber raftsmen from Schuylkill County. By 1915, the building was used as a club for lawyers and as a place to picnic. On June 17, 1916, a 200th Anniversary celebration was held at the property and was attended by the Historic Society and by a descendant of Mounce Jones. Then, the building was used as dwelling until 1932. The house is the oldest documented dwelling in Berks County. It was built in 1716 by Mounce and Ingabor Jones. While this building is considered to be the oldest extant structure in the county, it is by no means the first structure that was ever built in Berks County. Also, considering the amount of restoration and reconstruction that the building has gone through, it is hard to truly consider it the oldest standing structure in the county. The original structure on the property was probably a log structure located somewhere on the river side of the current structure. A foundation for this structure had been located during the restoration of the house. The current house itself stands at the south end of what was the original 498 acre tract acquired by Mounce Jones in 1701. It is a two and a half story sandstone structure. Stone construction was adopted by the Swedes only after the mass immigration of English and Welsh Quakers to Pennsylvania in the 1680s. Prior to this period, the Swedes were known for their log structures. Clearly, this house reflects the fact that the Swedes were quickly becoming acculturated into Anglo-American society. Originally, the building would have been a 20 by 36 foot home in the style of an English hall-parlor home with casement style windows. There also was a deep cellar which was filled in over the years by continuous flooding by the Schuylkill River. At some point, the original partition wall on the first floor was removed—this wall would have divided the hall and parlor. There is a corner fireplace in the parlor (representing lingering Swedish influence) and a gable roof. At some point, the second floor had been divided into three small rooms with a hall running from east to west for access on the river side. The house was one of the few river front properties to survive the 1850 flooding of the Schuylkill River. During the nineteenth century, the property suffered much flood damage. By 1916, the property was being flooded regularly. At least by 1937, the house’s stone walls and been plastered over and the roof was covered by slate shingles. In 1952, while workers were burning debris during the removal of the Douglassville Covered Bridge, the roof caught fire and later collapsed from heavy snowfall in 1958. By 1961, the structure was in ruins and was regularly being flooded by the Schuylkill River and contained a heavy deposit of silt in the cellar and first floor. The roof and second floor had collapsed along with the entire eastern elevation. Part of the northeastern chimney had fallen as well. The area around the house was heavily wooded and overgrown. In 1963, the original date stone was stolen from the building. However, it was later recovered while the house was being restored. The Historic Preservation Trust of Berks County began restoring the property in 1965 and it took three years to complete the work. Some of the lumber from the covered bridge was used to make window frames during the restoration. Then, in January of 1978, a Proof of Loss claim was filed with the Department of Housing and Urban Development due to severe flooding that had occurred at the property once again in the early 1970s. This flood was probably the one that occurred in 1972 when Hurricane Agnes hit the region. Currently, the Mounce Jones is mostly restored and in a fine state of repair. It is open to the public periodically during the year. Between 1704 and 1705 Swedes took up tracts within this land grant. Not only did these Swedes receive large land holdings, but they did not have to pay for them either. The only compensation that Penn received from the Swedes was an annual quit rent of one bushel of wheat per one hundred acres. Ironically, very few Swedes actually settled on these lands. Only seventeen Swedish families actually acquired land grants in eastern Berks County. Of these seventeen families, only Mounce Jones and his family moved into Berks County. By 1740, only 1,350 of the original 10,000 acres were still in Swedish lands. In 1719, a petition was presented for the creation of Amity Township. However, it was not signed and approved until 1744. Amity Township was the first township in what eventually became Berks County. The township’s boundaries are almost identical to the boundaries of the original 10,000 acre Swedes’ tract. The name Amity derives itself from the peaceful relations the settlers had with the local Native American population. Mounce Jones acquired 498 acres of land from the Swede Tract on October 21, 1701. However, this tract of land was not actually patented to him until May 15, 1705. From the Journal of Andreas Sandel—pastor of Gloria Dei Church of Philadelphia—it reads in 1704: “The 15th of October I traveled together with Gustav Gustafson, a Swede, and Daniel Falckner, a German, to Manatawny, where the Swedes have 10,000 acres, and one Swede, Mans Jonasson, has begun to dwell there.” The tracts of land which the Swedes acquired were long and narrow with a very small river-side frontage. These tracts of land were shaped this way so that each settler could have access to the Schuylkill River. Everyone having equal access to the river is indicative of the importance of the river to these people—remember there were no roads yet. Similar land patterns can be found in French Canada along the St. Lawrence River. Jones had to pay an annual quit rent of 165 bushels of wheat to the Penn family for this land. In 1725, Mounce Jones is known to have owned about 740 acres with three homesteads. When Mounce Jones died in 1727, his son Andrew inherited the property. At the time Andrew Jones received the property, it contained 264 acres. Two hundred acres of the original property had been deeded in 1721 to Jones’ brother-in-law Andrew Laicon. Also, Mounce and Ingabor Jones donated the land for Morlatton Church (today Saint Gabriel’s Church) around 1719. The 1734 tax list shows Andrew Jones owning 220 acres. In 1745, William Bird purchased the property from Andrew Jones. On July 29, 1746, Bird sold the land to Thomas Banfield. John Kirlin, the last Swede to own the property, acquired the house in 1757. The 1767 tax records have John Kirlin listed as a blacksmith with fifty acres of land and a tax of 2 pounds. In 1804, George Douglass, Jr. purchased the property from John Kirlin. In 1944, the estate of the Douglass family (which had owned the land since 1804) sold the property to Earl Schurr, at which time it contained five acres. In 1961, the property was owned by Roy Schurr (who had acquired it from his brother) but was unoccupied and unused. 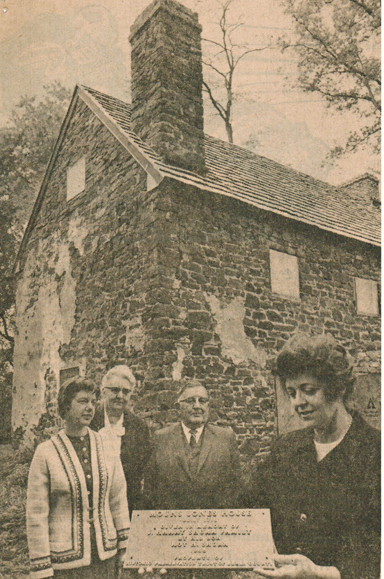 The Historic Preservation Trust of Berks County acquired the house along with 1½ acres of property in 1965, through a gift of the Roy Schurr family under the stipulation that it be restored. It was in a state of ruin at this time. Apparently, the last occupants of the structure were chickens, judging by the condition of the interior at the time of transfer of ownership. On January 21, 1974, the house was placed on the National Register of Historic Places. Currently, the house is a fully restored 18th century structure nestled along the edge of the Schuylkill River and maintained by The Historic Preservation Trust of Berks County. 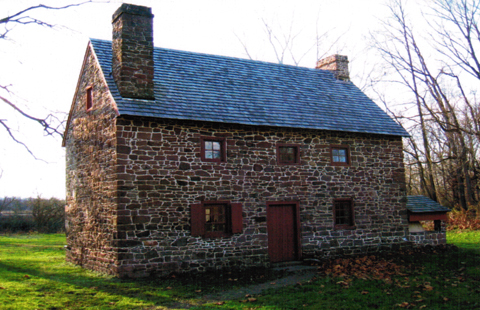 Interested in learning more about the Mouns Jones House and the Historic Preservation Trust of Berks County? Search records, pictures, images, architectural drawings and more in our Online Archive .